The list of guidelines was then condensed and categorized as described below. After discussions with Doug Bowman regarding his user interaction taxonomy, it was observed that the taxonomy, albeit rich in detail, was designed specifically to structure user interaction techniques - which mainly consist of input device(s) and As such, Bowman's user interaction taxonomy does not currently provide the breadth required to structure the AR usability space. Conversely, the framework of usability characteristics for VEs was designed to organize the virtual environment usability space - independent of specific display types, tracking systems, or computer hardware (the main differentiating factors between VEs and ARs). The framework was reviewed for appropriate coverage of the AR usability space, and was subsequently chosen as the structuring guide for the (previously) unstructured AR usability guidelines. One approach to ordering a space of VE usability-related information is to use general theories of human-computer interaction (HCI) as a guide. The framework uses Norman's "theory of action" [Norman, 1990] as a time-proven foundation upon which to base its current organization. This theory of action defines several stages of activity and associated interdependencies that are inherent in interaction between human and machine [Norman, 1990]. 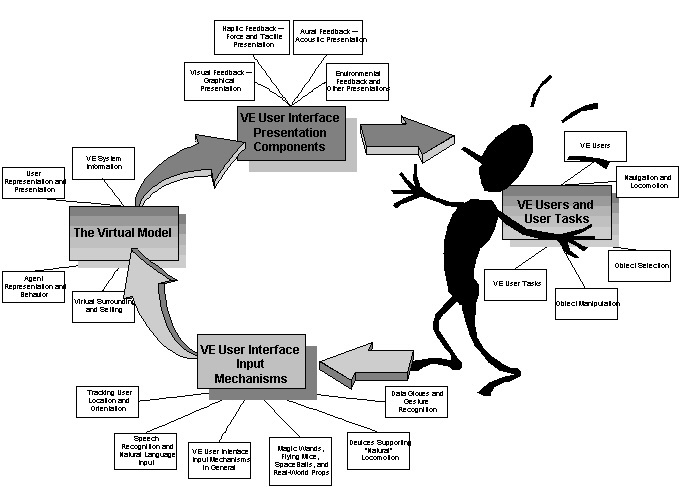 It consists of several stages of user activities involved in a user's performance of a task, each of which are relevant in VE user interaction. Moreover, the theory of action is particularly well-suited for addressing how individual usability issues fit into a more abstract, larger-scale understanding of interaction between users and VEs. In particular, Norman defines a "gulf of execution", which is bridged when the commands and interface mechanisms of an interactive system (in our case, VEs) match the intentions of a user. In the case of VEs, Norman's "interface mechanisms" can be specified as "VE User Interface Input Mechanisms" (e.g., glove, wand, 3D mouse). Norman also defines a "gulf of evaluation", which is bridged when system output (presented via an interface display) provides an appropriate conceptual model that a user can readily perceive, evaluate, and understand. Norman's term "interface display" is mapped within the framework to "VE User Interface Presentation Components." We intentionally chose the term "presentation", rather than "display", to reflect the multimodal presentation capabilities of VEs. These mappings are depicted in Figure 1. An important insight presented with the theory is the need to bridge the gulfs between "goals" and "physical system." This notion is applicable within the framework as well, emphasizing the bridging of "VE Users and User Tasks" and "The Virtual Model." Thus, the four major areas shown in Figure 1 are strongly influenced by corresponding components of the theory of action, and the flow is strongly influenced by the theory's corresponding flow. Figure 2 contains a more detailed level of framework refinement for each of the four major areas, shown as white boxes. For example, "VE User Interface Presentation Components" is refined into "Visual Feedback", "Haptic Feedback", "Aural Feedback", and "Environmental Feedback and Other Presentations."